It seems that we haven’t had more than one sunny, dry day at a time for a month now! Our North garden is basically white clay and you can’t even walk in there without sinking to your shins in gumbo. And we’ve had enough heat that the weeds are having a field day … literally! 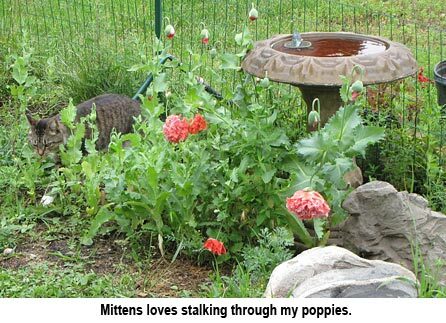 Oh well, the garden plants do look good even if they are weedy. 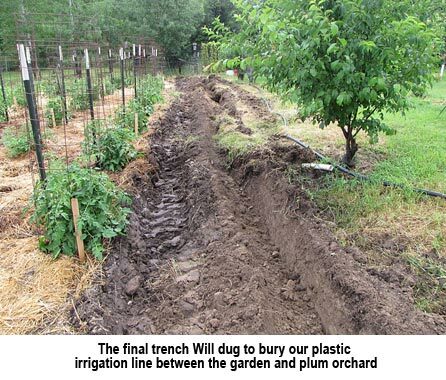 Another job was burying the plastic irrigation line which runs along our main garden, below the plum orchard. This was always a “nasty” area because I couldn’t mow it with the lawnmower because the pipe laid in there … somewhere. 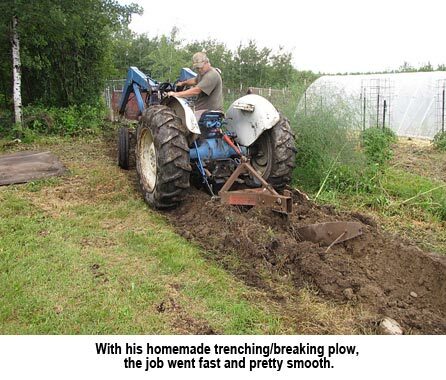 He built a trenching plow out of junk (of course!) and with it hooked to the three point on our Ford 660, he was able to run a trench quite easily. Now the pipe is buried and I will be able to mow there. Hooray! By the way, this pipe is only buried about a foot and half deep but we completely drain the irrigation line in the fall so there is no problem with freezing. No, he hasn’t and he’s about biting himself because of it, along with all the farmers around here. Some have had hay down for two weeks, being rained on nearly every day. Issh! Has Will been able to start making any hay between all the rain drops? Just wondering if the big new tractor is working well too?